Revenant Weapons are Fabled Weapons that are initially found in Unite and Fight events. 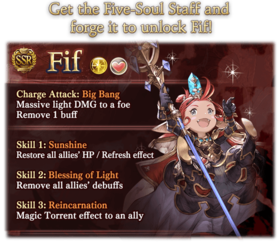 After a long, arduous upgrading process that requires some thousands of items, crystals, and rupies, you can recruit a powerful SSR Eternals character. When going through the shop to upgrade your Revenant Weapon, you will only be able to see the materials needed for the current step. This guide outlines all the materials necessary so that you can gather them all at once. 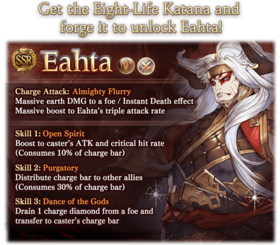 NOTE: It is only necessary to complete every step to recruit the Eternals character and/or enhance the charge attack. If you only want the Light-element weapon with the basic charge attack, stop after completing Awaken the Revenant Weapon. If you want a weapon in your element with the basic charge attack, stop after completing Change the Revenant Weapon's Element. The first step is to get the initial weapon from a Unite and Fight event. When the event is live, visit the Token Draw page to choose which weapon type you want as the prize for this event. Once per event you can change the weapon that will be in the box. This can be done when resetting the box contents. 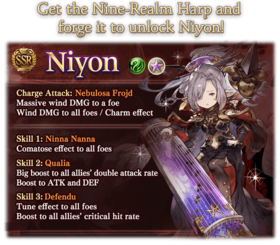 It is sometimes suggested for newer players to choose the dagger or harp first, since the Charge Attack is extremely useful on them; the dagger increases multiattack rate, and the harp heals. Participate in event raid battles to obtain event tokens which are used to secure 4 copies of the weapon. It needs to be fully uncapped and upgraded to level 100 for the next step. The weapon you upgrade dictates which Eternals character you can recruit at the end of this quest. Since there is a Unite and Fight about every month you'll have opportunities choose a different weapon if you wish. You are not limited to recruiting just one Eternal, but the costs in material and time are very high, so choose carefully. Refer to the individual item pages for information on where to obtain them. WARNING: Stop here if you only want a Light-element weapon with an awoken Charge Attack. The next step will cost many Light materials but only increases the weapon's stats marginally. If you do not want the character associated with your weapon, the stats by themselves are not worth the large amount of materials. Even though your weapon starts out as Light element, you still need to perform this step even if you want it to remain Light. The element you change your weapon to does not have to match the element of the character you want to obtain, i.e. 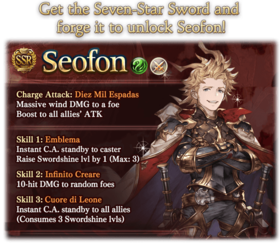 if you are crafting a Seven-Star Sword, you can change its element to Dark and you will still obtain Seofon. 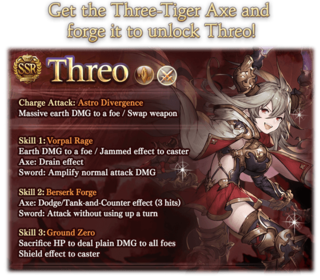 The Eternals 5★ uncapping process requires equipping the Revenant Weapon as your main hand and dueling against the Eternal. You will be required to build at least two element-changed Revenant Weapons during the process, so avoid choosing for all of these an element that is weak to the Eternal that you want to uncap to 5★. (For example, if you want to uncap Seofon to 5★, avoid making only Earth-element Seven-Star Swords). To change your Revenant Weapon's element, you must create a precious-stone relic and feed it to your Revenant Weapon. To create a relic, you need a level 75 Rusted Weapon of the same weapon type as your Revenant Weapon. Rusted Weapons are common drops from Proto Bahamut and rare drops from Angel Halo. 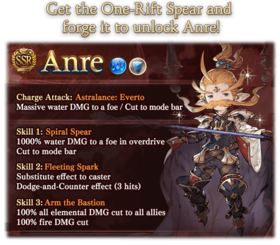 If you are not lucky enough to get 4 copies of the same weapon, remember that you can use Steel Bricks from the casino to uncap Rusted Weapons. After you create the relic, you need your Revenant Weapon's skill to be 10 in order to proceed. Feed the Rusted Weapon along with 3 True Animas in the desired element to the Revenant Weapon to change its element. The skill level is saved with every step in this process, so feel free to start leveling up the weapon skill as soon as you obtain your first Revenant weapon. WARNING: Stop here if you do not want the character associated with your weapon. At this point, your weapon has its awakened Charge Attack and is the element you want. 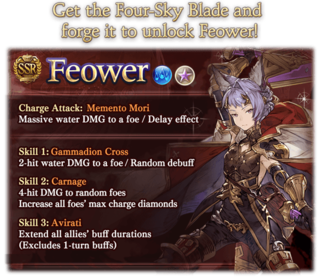 Further steps will increase its stats marginally, but, if you do not want the character, the stats by themselves are not worth the large amount of materials. Next, you will need to upgrade your Revenant Weapon. First, however, this requires the Knickknack Shack to be upgraded. To do this, you need a number of 01 weapons that can be obtained from Unite and Fight draw boxes or Rare Monsters. You also need 5 Mithra Animas from Golonzo Island, the 8th island. See the Rare Monster page for details on where any weapon you're still missing after Unite and Fight can be found. This step is only necessary once per account. If you are upgrading another Revenant Weapon, you will not need to upgrade the shop again. This last step consists of 6 separate upgrades, each requiring more, rarer items. Once again, refer to the individual item pages or the general Items page for information on where to obtain them. Any non-specific items need to be in your desired element for that item type (e.g. if you are making a fire weapon, Whorl will be Infernal Whorl). Here are the total numbers of items you need for the entire process from start to finish. This Google Spreadsheet can be used to track your total materials and overall completion percentage. It is protected, so make a copy of it (File > Make a copy...) on your own Google account to maintain your own updates. You must now defeat the Eternals character in a Fate Episode in order to recruit them. Good luck! If you want to recruit another Eternals character in the future, the only step you can skip is upgrading Sierokarte's shop. All other items must be gathered again. Light damage to all allies.Damage is increased base on number of debuffs. 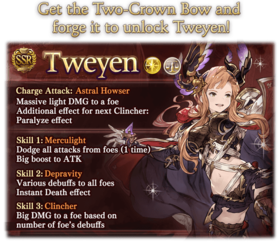 Remove all debuffs from Tweyen. Remove all buffs from all allies. Takes priority over Depravity. Casts Trial of the Eternals. Strength: 50% on all allies. 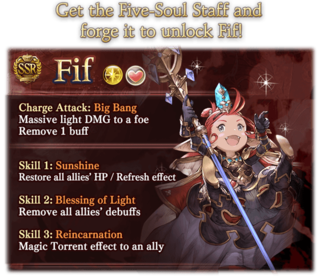 Remove all buffs and debuffs on all allies and Seofon. Takes priority over Infinit Klearre. 10-hit Wind damage to random allies. On the next turn, it'll have 3 turns remaining. to all allies. Resets mode barVerification needed. , then casts Infinit Klearre.
. Avoid debuffing him with it if possible. On the next turn, it'll have 3 turns remaining. on all allies. At around 50%, a Full Chain should be able to defeat him with a buffed up party. Boss Niyon ?? 9,000,000Verification needed. If you are a Fire player trying to unlock your first Eternal character, try to concentrate on buffing your party instead of debuffing Tien, as those are very unlikely to land. Stardust hits hard and can potentially kill an unlucky character who gets hit multiple times. 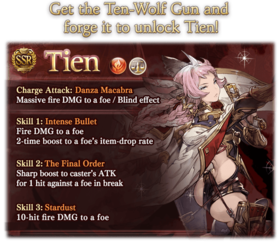 Try aiming to inflict 2,000,000 damage or more on the first turn to get Tien bellow her 75% Trigger, which will cause her to use The Final Order to buff herself instead. If you can keep up this amount of damage on every turn, you can basically breeze through the fight unscathed as Tien will be locked into casting The Last Order instead of attacking. Even doing so every other turn should be enough to have an easy time defeating her, making a very offensive MC job and characters choice a good strategy. Please see the Uncapping Eternals page. All Revenant Weapons have the same Charge Attack before they are forged to Sterling, a 20% boost to the charge bar after the Charge Attack is performed. After this upgrade they gain their unique Charge Attack which is improved further when fully awakened. Sterling - Normal attacks hit all enemies. Awakened - Normal attacks hit all enemies (4 turns). Sterling - Inflicts 30% Defense DOWN. Awakened - Inflicts 35% Defense DOWN. Sterling - All allies gain 30% Multiattack Rate UP (3 turns). Awakened - All allies gain 35% Multiattack Rate UP (3 turns). Sterling - Heal all allies for up to 2000 HP and apply Refresh (up to 500 HP, 3 turns). Awakened - Heal all allies for up to 2000 HP and apply Refresh (up to 600 HP, 3 turns). Sterling - All allies counter up to 3 times for 100% damage (2 turns). Awakened - All allies counter up to 3 times for 150% damage (2 turns). Sterling - Randomly reduce the cooldown of 1 skill by 1 turn. Awakened - Randomly reduce the cooldown of 1 skill by 1 turn. Boost charge bar by 30%. Sterling - Heal all allies for 11% of Max HP (up to 2000 HP) and gain Debuff Success Rate UP. Awakened - Heal all allies for 16% of Max HP (up to 2000 HP) and gain Debuff Success Rate UP. Sterling - Gain 20% Attack UP and 20% Skill Damage UP (3 turns). Awakened - Gain Attack UP and Skill Damage UP (3 turns).